Heptacodium miconioides (Heptacodium miconioides): growing, planting, caring. A large shrub with unusual features. Full description for Heptacodium miconioides not yet available. 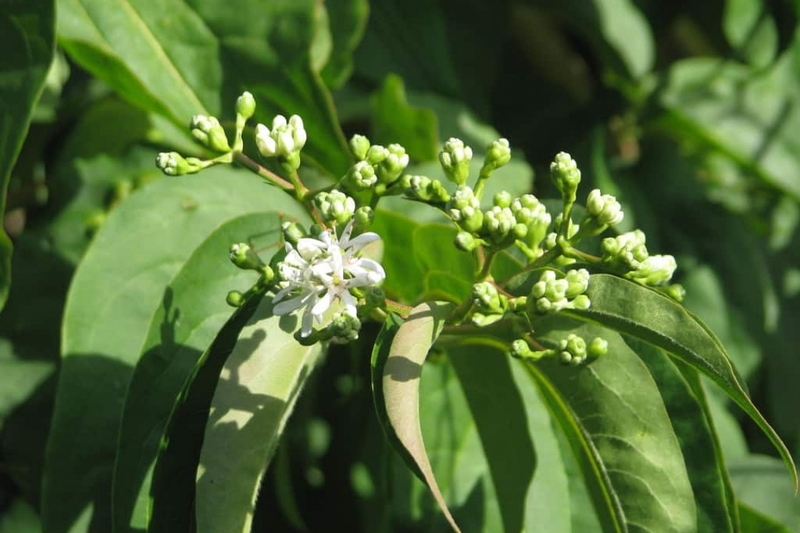 Heptacodium miconioides is a large shrub of the family Caprifoliaceae up to 5 meters in height and as much in width. Its leaves are elongate, opposite. The flowers appear in August, are grouped into panicles and formed of five white petals organized into stars. They then form red chalices. The bark is beige pink, smooth, and exfoliates regularly. In open ground, plant preferably in autumn, possibly in early spring, outside periods of frost. Find a sunny location, in not too calcareous, draining soil, in the sun or in partial shade. Plan during planting that this shrub will attempt to reach 4 x 4m, so keep some space around it, unless you want to prune it a lot later. At planting, make a hole 2-3 times wider than the root ball and twice as deep as this one. Soak the root ball for 30 minutes. Refill with half of the earth, arrange the root ball at the bottom so that the collar reaches ground level. Then replace the rest of the earth with some compost, tamp it with your foot, then water copiously. Mulch. In pots, plant in a mixture of garden soil and mature compost in a large pot - 50L minimum - with a cup. Water and mulch. Water regularly and generously for several weeks after planting or sowing, especially if you did it late in the season. After, you only have to worry about watering if your plant is potted. Outside of these conditions, it will manage on its own. Pruning is not mandatory, but you can try to shape your Heptacodium. In this case, cut in late winter. For a more compact shape, shorten all branches. For a more aerial shape, lighten the lower branches that take an horizontal path. Do the same to shape it into a tree, but keep only one trunk. Renew mulching in the fall at the bottom of your Heptacodium.